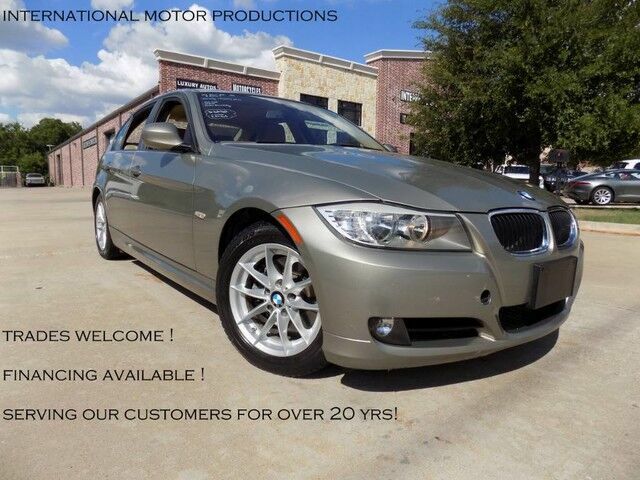 ONE OWNER* CARFAX CERTIFIED w/ NO ACCIDENTS REPORTED- NORTH TEXAS BMW! THIS 328i GIVES YOU LOTS OF POWER AND THE LUXURIOUS, SPORTY RIDE THAT BMW IS KNOWN FOR! IT IS THE ULTIMATE DRIVING MACHINE! Includes Features such as Beige Leather, Automatic/Steptronic Transmission, All Power Options, Leather Multifunction Steering Wheel, Heated Seats, Dynamic Traction Control, Dual Climate Control, Wood Trim, Stereo w/AUX/USB/CD, Carpet Mats and Alloy Wheels! It has been Pre-Qualified for a Comprehensive Warranty. Please Inquire. - *THIS BMW IS A ONE OWNER- IT SHOWS ON CARFAX AS A 2 OWNER BUT THE CUSTOMER ORIGINALLY TITLED IN HIS COMPANY NAME AND THEN ALMOST IMMEDIATELY REGISTERED IT AS HIS PERSONAL CAR. - TRADED AT PARK PLACE - WHERE WE PURCHASED IT! Our mission is to offer the highest quality vehicles at the lowest possible price while providing the best buying experience for our customers in the most efficient manner possible. !! !INTERNATIONAL MOTOR PRODUCTIONS Always has a great Price!!! **4YR/unlimited mileage warranty is available, w/ very comprehensive coverage, at a VERY LOW COST** International Motor Productions offer a variety of extended used car warranty options with various levels of coverage. We offer multiple warranty packages from Performance First, Alpha Warranty, Amerigard (Motor For Life), Red Shield, Velocity, and SCM. We carry multiple policies so that we can give you the option to select the coverage that best fits your personal situation.We also provide Autocheck and/or Carfax for all of our cars. THIS VEHICLE IS AVAILABLE TO LOCAL AND OUT-OF-STATE CLIENTS. OUR VEHICLES SELL QUICKLY BECAUSE THEY ARE THE NICEST VEHICLES FOR THE BEST PRICE! IF YOURE INTERESTED PLEASE DONT HESITATE TO CALL US DIRECTLY AT 972-478-7900 WITH ANY QUESTIONS. To get qualified for FINANCING fill out a credit application at www.internationalmotor.com . !!!! TRADES WELCOME !!!!! NOTE: In the EQUIPMENT section, in the description of the vehicles in our inventory, there is a list of everything that vehicle was equipped with when it was sold brand new. As a pre-owned vehicle, certain items such as floor mats, additional keys, fobs, manuals, etc might have been misplaced by previous owners. We have no control over this and apologize for any confusion this may cause when searching for your vehicle on our web site.